Rail technology leader Bombardier Transportation has successfully delivered the first of Queensland’s 75 new trains in Brisbane. Paul Brown, Bombardier’s QNGR Project Director, said the train departed last month from the company’s manufacturing facility in Savli, India, and travelled more than 10,500 km by road and sea before it arrived at the Port of Brisbane. “We are delighted to be unloading the first of Queensland’s New Generation Rollingstock (QNGR) trains here in Brisbane,” Mr Brown said in a press release on Market Wired. This six-car, 260-tonne train is part of the new fleet of 75 trains that will replace an ageing fleet and increase the overall size of the passenger train fleet in South East Queensland by 30 per cent. Mr Brown said the remaining 74 trains will be delivered and rolled out onto the South East Queensland passenger rail network over the next three years as part of the QNGR project which a Bombardier-led consortium won in January 2014. 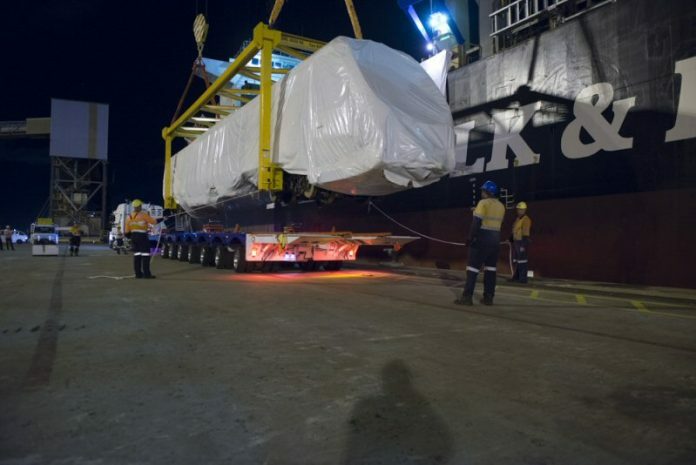 Bombardier said its technical specialists will connect the six-cars over the next few days, making them ready for the locomotives that will haul the complete train to the new purpose-built Wulkuraka Maintenance facility. The train is expected to enter service on the South East Queensland passenger rail network in the second half of the year.